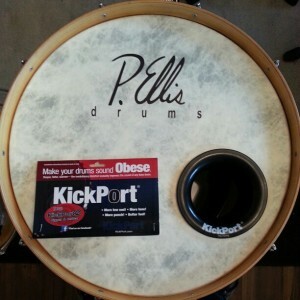 I’ve seen lots of Kickport’s installed on lots of different drums lately, and to be honest I didn’t really want to jump on the bandwagon. I don’t have any good reason of not wanting to jump on the bandwagon, other than the fact that I think that my kick drum sounds perfectly fine the way it has always been. However my good friend Daniel is a connoisseur of fine drums, and he had installed one on all of his drum kits after he installed it on the first one. I heard Daniel’s kick drum and thought it sounded fine, but I’ve just never blown a gasket over it. However our sound guy (Aaron Ivey Band) ran sound for a band that Daniel was playing drums for and he flipped his lid over the Kickport. He wouldn’t stop nagging me to get one, so I finally gave in. Probably not what you were expecting right? It wasn’t what I was expecting either. I was so disappointed. I had gone out of my way to buy this fancy piece of plastic and for what? I called my friend Daniel to see if he could help me out with the tuning. He recommended that I tune the resonant head much tighter than I was used to tuning it because the Kickport drops the note of the kick drum a whole octave, so you can get away with a higher front head tuning. I did this. Still sounded bad to me. He told me to take out any extra muffling that I had inside the bass drum. I did this. Sounded even worse. This was helpful. I tried to keep the difference in pitch of the batter head 1/3 lower. This sounded better. Then I stuck the Evans EQ Pad back inside my drum, but without it touching the reso or batter head. This sounded pretty good to me. I kept playing on it and tweaking it for about 2 weeks before I had the chance to play it through a nice sound system with our sound guy at the helm. Todd ran sound for us and through out the day, we played 4 different sets, each of which he dialed in the kick drum sound even more. At the end of the day Todd let me know that was the best my kick drum has ever sounded. I trust Todd with our sound and that’s all I needed to hear to convince me to keep using the Kickport. I have been happy with my kick drum sound for decades. I feel confident in my ability to tune drums. However when I got out of my comfort zone for tuning my kick drum, I blamed it on the product, and got mad because it made me feel like I didn’t know what I was doing. Since I have had some time to learn about the product more and make the necessary adaptations, and after hearing the affirmation from our sound guy, I can confidently recommend this product to you. You can click on any of the blue Kickport links in this post to purchase one on Amazon. I know I’ll be using it on all my personal drums from now on! 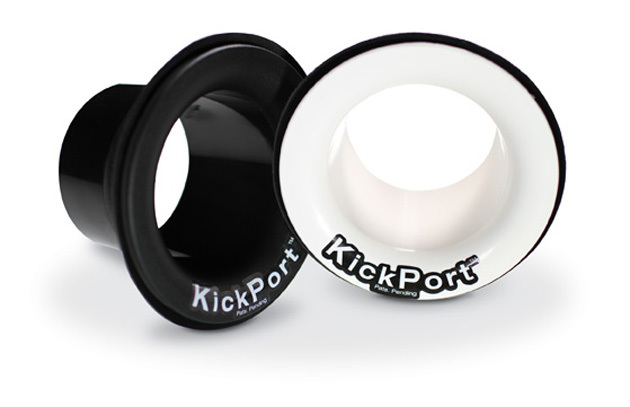 What is your experience with the Kickport? Leave a comment below to start a conversation! 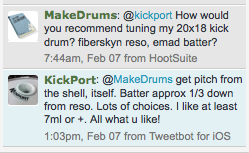 It sounds like there is a pretty steep learning curve for tuning with the kickport if you’ve never used one before. Thanks for the tuning tips! I’m about to install one of these on my kick drum. For me there was a learning curve. However I feel like now that I know what to expect when I install a kickport on any other drums, I’ll have a much easier time getting the drum to sound good. Good luck with your kick drum! Let me know how it goes! I installed one in my 22×18 DW last week. After playing with the tuning for a few minutes it really woke that bass up. I was happy with the sound before but there was a noticeable difference once I installed the Blue KickPort. I use Aquarian Super Kick II heads on both res. and batter, bought the set with preinstalled muffling and 4.5″ port on res. 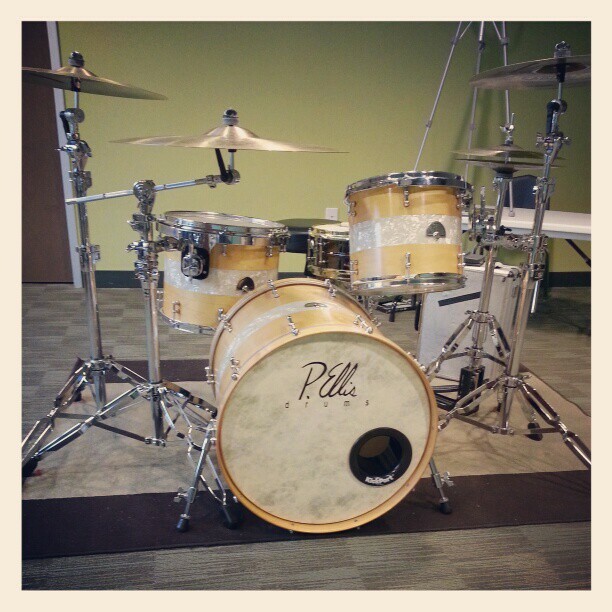 Best $40 I spent on these drums since buying the Aquarian heads.